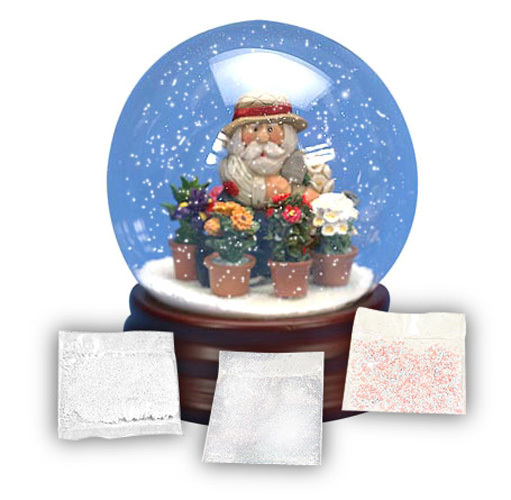 WATER GLOBE SNOW FLAKES: Available by the package or pound for volume users. A package of Water Ball Snow Fakes is about 1 tspn. - enough for approx. one water globe. Drifting Snow and Glitter add an exciting dimension to Water Globe creations! (A) Water Globe Snowflakes - Sm. Pkg. A) White Snowflakes for Water Globes. These 3-dimensional white bits are like the "snow" found in traditional Snow Globes. This is enough for a 4-6" Water Globe. A) White Snowflakes for Water Globes. These 3-dimensional white bits are like the "snow" found in traditional Snow Globes. Large Economy 1 Lb. Package is enough for up to 125 4-6" Water Globes. B) Multi Color Pastel Flakes for Water Globes. Pink, blue & white Drifting Bits are ideal for adding a festive look to water globe creations. C) Iridescent White Glitter for Water Globes. Glitter with shimmering colors adds a special highlight to water globe creations.